We are taking five weeks to unpack true Christianity from the first authoritative account of the first Christian church recorded in Acts 2:40-47. This week we get insight into the second of four “vital signs” (i.e. signs of life) of true Christianity: immovable truth. True Christianity has an immovable commitment to God’s truth, revealed in the Bible and summed up in the person and work of Jesus Christ. 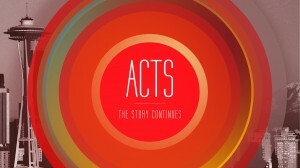 This morning we find ourselves in the middle of a short series-within-a-series (Acts) on true Christianity, based on Acts 2:40-47. Contrary to popular misconceptions, Christianity is not a club, something we “pick up”, or “sign up” for that involves just one part of life. Rather, true Christianity is God-initiated, Jesus-centered, involving the entire person (heart, mind, will). This passage gives us the first authoritative glimpse into the first Christian church in Jerusalem. From it, we see four vital signs (i.e. signs of life) for every church and every Christian. True Christianity results in a new community, shaped by new truth, engaged in new worship, sent on a new mission. First, what is the “Apostle’s teaching”? Q: What is the primary content of the “Apostle’s teaching”? #3 Entire NT written by the apostles and associates. Therefore, it is safe to assume that the “Apostle’s teaching” is what today we call the Bible. Q: What is the primary message of the “Apostle’s teaching”? Therefore, the Apostles taught from the Bible about the good news of Jesus Christ. Why does all of this matter to us? Significantly, the bible doesn’t claim to be one option in the company of many other viable options. No. Instead if makes a significant (and controversial) claim, a claim to be the Truth. Q: What is Truth? Truth is what God says and we have what God says (accurately, not exhaustively) in Bible. (Grudem). Therefore, Apostles were teaching truth. This means we are to think of the Bible as the ultimate standard of Truth; the ultimate reference point by which every other claim to truthfulness is to be measured. (Grudem) In other words, the Bible serves as the plumb line of the universe, the universal standard for Truth. This is an astonishing claim. Yet, even more amazing is that the Bible tells us that this truth of God is summed up in the life and work of Jesus Christ. Six examples of major compromises to the truth of God. LIBERALISM. Biblical liberalism emphasizes the moral aspects of Christianity, while minimizing truth. Jesus is seen as a moral teacher who occasionally said some hard things. Biblically liberal churches believe very little. Typically they do not believe that Jesus was God, nor born of a virgin, nor in the “new birth”, nor in the unique authority of the Bible. Biblical liberalism touts salvation by good works. NOTE: This liberalism refers to biblical liberalism, not political liberalism. There are no direct correlations between Christianity and politics (i.e. “as though you must be a Republican”). You can be a Christian and be a Democrat or a Republican. However, due to Christian stances on particular issues (e.g. abortion) Christians tend to fall in the range of conservative Republicans to neo-Democrats. ECUMENISM. Evangelical + Catholics + Liberals together. Ecumenism reduces the truth while elevating unity. We want unity but the ultimate, bottom-line, question is “What is the church?” – Who is Jesus? What has he done? What do you say about Book? These are the things that define the real biblical church. We can’t go anywhere if don’t believe Jesus is the unique Son of God and salvation can only be had by faith in Him. Ecumenism touts salvation by unity. UNIVERSALISM. Universalism is the belief that all people will be saved. It is a very popular that no one goes to hell. Therefore, there is no need for Jesus. Universalism, in effect, touts salvation by death. (i.e. all you have to do to be saved is die). EMOTIONALISM. Emotionalism says that the highest source of truth is not the Bible, but what I experience. Something is only true if I like it. Emotionalism emphasizes how I feel, what I like, and “what I believe in my heart” over what is written in the Bible. It is a retreat from the objective authority of written truth. Emotionalism touts salvation by “following your heart”. POPULARISM. Within the church, popularism is a preoccupation with image and influence. The basic idea is that for us to win the world, we must win the world’s favor. Maybe when the world likes the church, then they’ll like Jesus. The inevitable goal is to make unconverted sinners comfortable with the gospel (the major problem, of course, is that the gospel is not comfortable). FIRST, God’s people are to have an ongoing, persistent, immovable commitment to God’s truth (“devotion”). This is a picture of someone holding on for dear life (i.e. no matter the cost, what i suffer, when its popular and not, when I like it and I don’t). It is one thing to initially respond, but are you continuing? The key to our own spiritual growth is whether we’re continuing to submit ourselves to God’s Word. Are you in submission to God’s Word re: godly life? Baptism? Marriage? Family? Parenting? Finances? This is a vital sign of your faith and the church. Are you continuing steadfastly in the apostles teaching? SECOND, we are to speak the truth (“teaching”). The primary way of communicating the truth of God is speaking, teaching, preaching. It is precisely because Christian faith presents itself as objectively true that it has always exalted teaching. (Wells) Specifically, this takes the form of preaching on Sunday, but it is not limited to that. Generally, this refers to all of God’s people opening their mouths and speaking the stuff that is in this Book. We believe in the power of preaching. Not just up here, but in every community, at work, among neighbors and with your roommates. We believe in the power of proclamation of the truth. The power is in the truth, not in the proclamation. But, the truth must be proclaimed. Within the church, this means that we are committed to speaking truth to one another and other in love (Eph 4:15) Teaching, rebuke, encouragement, training in TRUTH of God. We all need others in our life to truth-and-love you (remind us of our identity in Christ, the character of God, the deceit of sin, etc). Sin is always the result of not aligning our lives with the truth of God. Jesus wasn’t lying when he said truth will set you free. That freedom is found in embracing, believing, and obeying the truth (Ex. Chester. God is good, great, gracious, glorious). To devote yourself to Apostle’s teaching means to live in the world shaped and informed by Truth of God. To love God passionately is to love Truth passionately. To love Truth passionately is to love Jesus passionately (who is the Truth). Means having an immovable commitment to the Word of God and the Gospel of Jesus Christ. Means letting the Scriptures interpret you instead of you trying to interpret them. Means allowing the Truth of encourage, edify, and give hope. Means allowing the Truth to confront, convict and rebuke. Both in culture and in Christian faith, and the center has given way, one might think that people would believe less and less. But the reverse has happened. A culture for whom God is no longer present believes everything. Who would have imagined that as we became more and more technological oriented, for example, millions of people would also become more and more devoted to astrology, directing their lives by what the planets were doing? Who would have expected that some of the most secular cities – LA, Amsterdam, would become hosts to a growing array of bizarre cults, many of which reek of primitive superstition? Who would have thought that after two World Wars and many others…Western thought would still be indulging in the myth of inevitable progress with a devotion that makes most believers look like pikers? When we believe in nothing we open the doors to believing in anything.